Our next destination was Ooty or Udhagamandalam which is one of the most famous hill destinations of South India. Any visit in the area seems incomplete without this jewel in the itinerary. So we had no intention of missing this must-visit destination. We decided to cover it over two days, including the trip of famous mountain railway toy train on the second day. We left Chennai on the night of 23rd December by Nilgiri Express and reached Mettupalayam by 6 in the morning. Mettupalayam is like a base town for the beautiful hill station that Ooty is. The road distance from Mettupalayam to Ooty is about 40 kilometers and the journey takes about an hour and a half if you can avoid the traffic and it seemed we were in luck. We had landed on the base station in time before the traffic started building up and hence we expected to be in Ooty in about a couple of hours. Obviously, who knows how many and how much the breaks we take on the way would be. With this in mind, we got into our car and headed to Ooty. Not long after when we left Mettupalayam, we started enjoying the real pleasure of visiting a hill station – the serene views, deep valleys, and green slopes. As we moved forward, we were being greeted with the awesomeness of Nilgiris. The entire stretch of the journey seemed pleasant and it was only as we were realizing the beauty we stopped for the first break. The Ketti Valley, also locally called the valley of view, which is said to be the largest valley of the world which provides the best location to see the depths amongst hills with the spread of greenery adding to the beauty. We spent some good moments there and proceeded forward towards our destination. Next, we passed through the Wellington Police Academy, which is a known name throughout the country for producing some gallant police officers. The cordoned off area of the academy with a giant gate was enough to envy those young officers being trained at one of the awesome locations. As we passed through the Coonoor region, which is almost midway between the base and destination, the scenery changed gradually to include tea plantations and while we were tempted to stop, we were reminded that this scene is going to be with us for most of the upcoming trip. In the interest of getting ahead of the traffic, we decided to skip these plantations for something which we now know was worth the wait. We also stopped by for a few moments at the Kattery Park on the way which is a children’s garden built in absolutely beautiful surroundings. One would find it difficult to imagine the beauty that nature has to offer and one needs to be present there to realize it. As we had anticipated, avoiding traffic helped us move fast and we checked in our rest house by 8:30 AM. It was really a lovely accommodation surrounded by hills and nested in picturesque scenery. The toy train tracks passed a couple of feet from the building wall and we could literally shake hands with the passengers while still being in our room. The room was well set up with all the modern amenities and it was an awesome place to spend our next two days of stay in this hill city. We rested for some time to get out of travel tiredness and had a great south Indian breakfast served in our room. We then proceeded for the site-seeing as it was difficult to restrain ourselves from all the beauty of nature surrounding us. Ooty is the headquarters of The Nilgiris district and is one of the famous hill stations in India. Situated on one of the peaks of the Nilgiri Mountain ranges, it is situated at almost at the juncture of the range with the Western Ghats at an altitude of 2,240 meters above mean sea level. The word Nilgiris means the Blue Mountains. 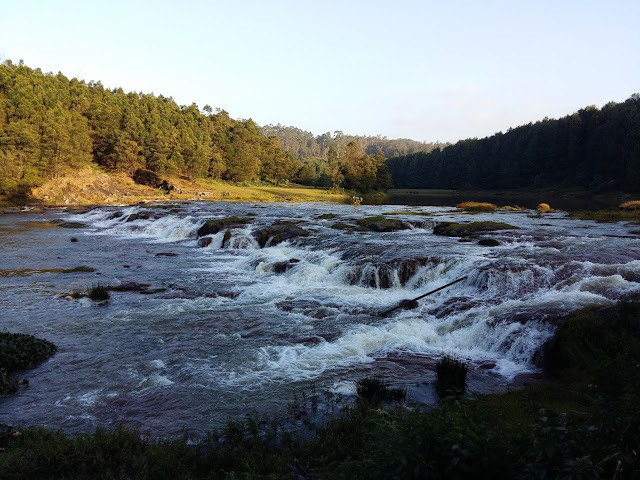 With nature's splurge, Ooty is rich with coffee and tea plantations, trees like conifers, eucalyptus, pine, and wattle. It is a land of picturesque picnic spots and had been a popular summer and weekend getaway for the British during the colonial days. However, before the British, there were Todas, an aboriginal tribe who inhabited the region since ancient times. The British constructed the first railway line in the area and made it the summer capital of the Chennai Presidency. Our first destination was the Dodapetta Peak, the highest peak of the Nilgiris and known as the peak of Tamil Nadu. We traveled for about half an hour to climb the roads towards this point and green slopes of the hills through the valleys abounded throughout the route to only become better from the top of the peak. The height of the location was enough in itself to give thrills and the breathtaking views of the hills were simply a cherry on the cake. There was a central viewpoint which provided a panoramic view around which, though good was confined to the glass walls. A short hike ahead the raw natural view was much more catching. Nothing beats a Chana zor garam (a snack) at this location. We spent some great leisure moments and then hesitantly decided to move to the next location. The next thing we planned to cover was the nearby tea and the chocolate factory - Dodapetta Tea Factory. This was one of the few factories which allowed tourists to get in and see the manufacturing process live in its operational environment. They had set up a good system to allow people to see how the famous Nilgiri Tea is made right from start to end. There, the facility manager himself was present to explain the entire lifecycle of tea making from plucking of tea leaves to fermentation and segregation to packaging with a live demo from within the sections of the factory. He explained the details of the process along with a difference in various types of tea over a complimentary cup of tea made from leaves processed in the same factory. The slight chill and steaming tea with this flavor and fragrance was sure to put up a question – can we buy some of it to take back home. Well, the answer was yes, but that was for a bit later. While we are on the topic, let me list down the tea making process we could grasp. To start with, we had already seen plenty of the tea plantations on our way. A careful protocol is followed to pluck leaves from these gardens ensuring only matured leaves are taken to the processing. These raw leaves are first boiled in commercial boilers and then dried and further roasted in specially designed burners which ensure that optimum temperature is maintained for sustained periods. Once the leaves turn brow they are subject to fermentation through natural ways which continue for about 4 hours and leads to the production of a special enzyme. This is the same enzyme which is part of wines thought there the density differs and it takes 12 years of fermentation to get to that density. Post fermentation, the tea leaves are segregated based on size and quality using special rotators which use segmentation mechanisms. High quality large sized leaves have the maximum flavor and aroma and are best to be consumed as black tea as the inert form brings out the best of such leaves. Since India is mostly a market where tea is almost always prepared with milk and sugar, such leaves are mostly exported. For India, the tea dust is the major product which provides taste and color that suits local needs. They also prepared flavored tea by combining ginger, cardamom or masala with the tea dust. Along with the tea production, the facility had a small chocolate making center where we saw how flowing chocolate paste was getting converted into freshly made mouthwatering desserts. We bought quite some tea and chocolates as souvenirs. Later we moved ahead to Botanical Gardens which were near the city. These gardens had well-manicured grasses and beautifully carved trees and hedges depicting various forms and patterns. It was indeed an awesome model of horticulture. There were many greenhouses to provide the right environment to hundreds of variety of plants and flowers spread over an expansive campus. This was definitely a place for interest for any botany enthusiast and though we appreciated the superficial beauty, a person really interested in this field would definitely find worth all the effort in maintaining such a huge garden. We spent over an hour there and then went for a quick tour across the nearby Rose Gardens. These gardens famous for numerous varieties of rose when on full blossom did play sort of spoilsport as it was seeding season and hence flowers were limited in numbers. We were starving by this point and hence we broke for lunch and Pakwaan Restaurant. The place had a decent spread with good food and nice ambiance and served good North Indian menu. We tried their thali which is economical yet provides enough variety over a 4-course meal. Post lunch it was time for another significant travel to our next point of interest which was about 20 kilometers from the city center. Though the travel was involved we were not repenting any moment of it. Lush green surreal views were more than enough to keep us going on the road. We were heading to the Pykara Dam when the clock showed 3. After about 40-45 minutes ride our car stopped by the Kamaraj Dam on the way. We visited the dam and then headed forward and soon reached the Pykara dam. A few kilometers ahead we had the landing to go for the boathouse which has a boating facility in the Pykara Dam. It is great boating experience in the undisturbed water of the dam reservoir that creates a lake of about 50 square kilometers and over 100 feet depth. The entire area is surrounded by lush green forests across Nilgiris. There is also a waterfall created by the dam’s extension which provides a good point to sit across and relax. There is also a viewpoint developed nearby called the Shooting Point owing to being the location of many Bollywood movie shoots. By now the time was running ahead of us and It was already about 5 and we agreed that it was time to begin our return journey as we had planned another important break before we returned to our abode. On the way, we had planned to stop to visit a place to understand the preparation of the Eucalyptus oil that is famous in this region. After crisscrossing barren fields and water channels we were brought in front of a small hut which had eucalyptus leaves mopped on walls and roof and was surrounded by dense reserves of these leaves around it. To make the oil, eucalyptus leaves are boiled and then undergone through sedimentation to separate water from a grey colored liquid. This liquid is predominantly comprised of eucalyptus oil which is taken to special purification units where it is diluted, purified, and packaged. We had amazing views all along the way with a cold breeze and low temperatures throwing in slight chills across. We returned to the rest house by late evening at around 7 and rested for a while with hot tea and good dinner. Christmas Eve, it was and we had a great dinner and retired to seclusion to enjoy the moments of this beautiful hill station on the great occasion. We spent the eve sipping Masala Chai and munching light snacks over long hours of aimless gossip and banter. The morning was planned to be leisure time to sit back and absorb the beauty of this lovely hill station at a gradual pace. We had a late start and after the quick walk we got ready and went across the markets and the city to explore areas. We bought some chocolates and herbal oils as souvenirs. Later we boarded the heritage toy train for a ride of a lifetime but that is for the next post as a small intro to that journey in this post would never do justice for this beautiful ride. Read the article on the Toy Train ride at Nilgiri Mountain Railway – Ooty’s Toy Train.